Our Bean Bag Chair Filling - Can't decide? We'll make it simple, we only carry the virgin style; and at prices lower then others sell the reground stuff. So, if your priorities are HIGHER cost, and the environment, choose reground (from someone else), but you don't mind paying a lot LESS and easy-positioning outweighs the environment, choose our virgin beads. (Styrofoam) beads for bean bags. 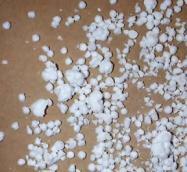 (Styrofoam) pellets for bean bags. Shipping in the continental USA is an FREE per box of filling. The refill is not heavy, but it is large. Shipping companies charge extra for what they consider "oversized" packages - but we got them and the competition beat! We can even offer customers in Alaska, Hawaii, Puerto Rico, Guam, & Virgin Islands the same FREE SHIPPING as we offer our customers in the lower 48 states. If your wanting shipping to Canada, please inquire with us before ordering. We can ship to international destinations, however shipping costs can be very high. Contact us for a shipping quote. Got a limp, flat, empty, dead bean bag chair? Want to bring it back to life? Want to enjoy it again? Why not replace the old, worn out, flat beads with our new fresh virgin Bean Bag Re-filler? What is the difference between our Virgin beads and the other ones? For one, ours are Virgin and the many others are recycled, and while that might be nice for the environment... wasn't the reason you wanted to recharge / refill your bean bag chair because it was flat and needed nice new plump beads? Another reason... To get a close up look of virgin beads we sell. Virgin (the ones we sell) - Pill-sized polystyrene (Styrofoam) pellets that are perfectly smooth and round. The "real deal" - no cut up peanuts here! Because the beads are all the same shape they shift around each other better when you are positioning your body in the bean bag. Virgin is also more dense than reground, so it doesn't go flat as fast. It does go flat eventually though, and how fast you have to refill depends on how much you use your bean bag and how puffy you like it. Some people refill within a few months (their kids use the bean bags as trampolines), some never refill and like them flat. The picture above is a photo of the Virgin Bead filler we sell. It's made of many round "pill"-like polystyrene particles and has never been used. It is NOT recycled, it is VIRGIN, never used. Squeeze one, it will bounce right back to it's original round shape. This type of refill pellet will keep your bean bag chair full, fluffy, and very comfortable for quite some time. Remember, some bean bag chairs use tiny, low quality recycled foam poly beads, which are often used as packing materials. When you use them as filler in bean bag chairs they are not very comfortable, and they wear out quickly. Our Virgin Bead filler was never packing material or anything else. It is made specifically for filling bean bag chairs. 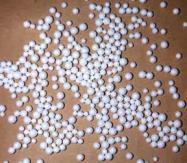 Virgin beads (photo on right) - in the shape of a round ball, these pellets are more uniform and stronger then recycled beads. The smooth round surface allows the beads to move around each other becoming easier to make the beanbag chair the form and shape you want. Additionally it will not go flat as soon as the recycled beads sold elsewhere. Reground (the style other sellers market) - Also known as recycled (although reground is not pre-used). Large blocks of polystyrene (Styrofoam) are ground up to make smaller pieces. Some pieces are pill pellets, but most are pieces that are made up of several pellets still stuck together, we find it to be dirty or used. When you are positioning your body in the bean bag, it takes more effort than with virgin fill. Most bean bags sold today are not filled with reground. We polled about 300 of our customer base and virgin bead was preferred 3 to 1 to recycled. Recycled Bead is polystyrene particles that have been ground into chunks. These are irregular pieces of polystyrene and wear down faster than virgin bead. There is another look at the BAD Recycled Foam Poly Bead filler. You do NOT want to use in your bean bag chair. 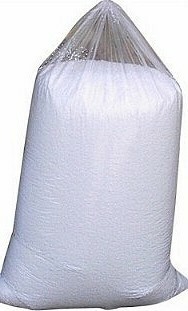 Because it's cheap, many bean bags are sold with this type of filler in the first place. It is former packing material that was ground down to smaller chunks and then used as bean bag filler ("recycled beads"). On the other hand our Virgin Beads were never used for anything else except filling up your bean bag chair. And that's what gives you a comfortable, durable bean bag chair. The best way to describe the difference is imagine when you buy a computer or electronic device, it is packaged with a Styrofoam protector which holds the component in place and prevents damage. Imagine thousands of these protectors being ground up into small little chunks, this is recycled bead. Virgin bead on the other hand has never been used and is in fact what recycled bead is before it is ever used. Manufacturers use pressure and steam to shape virgin bead into those computer and electronic device protectors. We do not use "PET" Eco-Beads, which is nothing more than a packing peanut cut into a circular bead. Please do not be fooled, we only use flame retardant eco-fill or virgin bead fillers for our bean bag chairs.Be aware of manufactures that use a 'Styrofoam' protector by pressurizing and steaming them. Our virgin beads are not pressurized or steamed. Recycled beads (photo on right) - do not have uniform shape and requires more work to get the beanbag in shape because of the lumpy uneven nature of the recycled beads. You might be able to get it to hold form, however it will not nicely mold to your body when you sit in it, it will crunch as you sit down. Additionally recycled beads do not hold up as long as the virgin round beads, the recycled beads will also go flat much sooner because of the uneven form. Make manufacturers use just the regular beads. Arrived very quickly and product was as advertised. Will use this seller again.